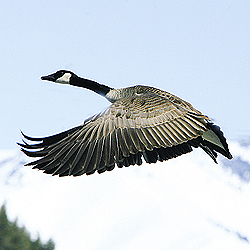 A Canada goose gracefully takes flight Thursday morning north of Ketchum. Canada geese (Branta canadensis) are capable of flying 60 miles per hour as high as 8,000 feet for 16 hours at a stretch. These honkers may migrate from the Arctic to the Southern states, but there are also many permanent resident Canada geese in Idaho.